불씨를 손으로 점화·발사하는 유통식화포(有筒式火砲)는 그 크기와 사용되는 화약의 양, 발사거리에 따라 4가지로 분리하여 천자문에서 그 이름을 따 천(天)·지(地)·현(玄)·황(黃)자총통이라 붙인다. 이 것은 그 중 가장 크기가 작은 것으로, 편리한 이동을 위해 만든 것이다. 총구경 4㎝, 전체길이 50.4㎝로, 임진왜란 5년전인 선조 20년(1587)에 만들었다는 기록이 남아 있다. 포 입구에서부터 점차 두터워지고, 몸에는 대나무 모양의 4마디가 표현되어 있다. 포의 끝은 둥글며, 첫째와 둘째마디 사이에는 손잡이가 달려 있다. 임진왜란과 병자호란을 겪었으나 모습이 완벽하고 제작년도를 알 수 있는 기록이 남아 있어, 화포사 연구는 물론 국방과학기술문화재로도 높이 평가 받고 있다. 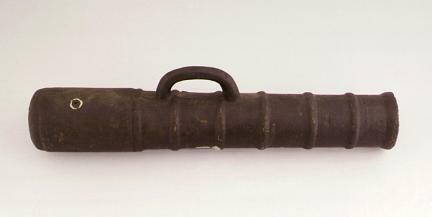 Hwangja Chongtong Gun is one of the cylinder-type guns that can be shot by manual ignition. 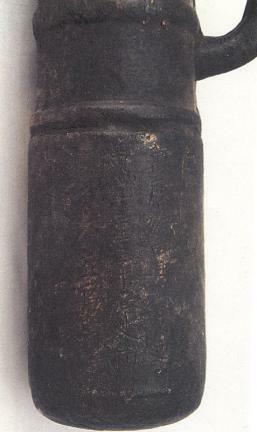 As the smallest gun of its kind with excellent portability, it has muzzle diameter of 4 cm and total length of 50.4 cm; the inscription on it indicates that it was made in 1587 (20th year of King Seonjo’s reign), five years before the outbreak of the war against Japan in 1592. The barrel has a growing diameter from the muzzle and four knuckles in the shape of a bamboo branch. It has a round end and a handle fixed on a space between the first and the second knuckles. Having preserved its original shape in perfect condition in spite of various difficulties like Japanese invasion and Manchu invasion in the 16th and 17th centuries, and with its inscription indicating its manufacturing year, it is regarded as an important cultural heritage for the study of the national defense technology as well as the history of Korean traditional firearms.